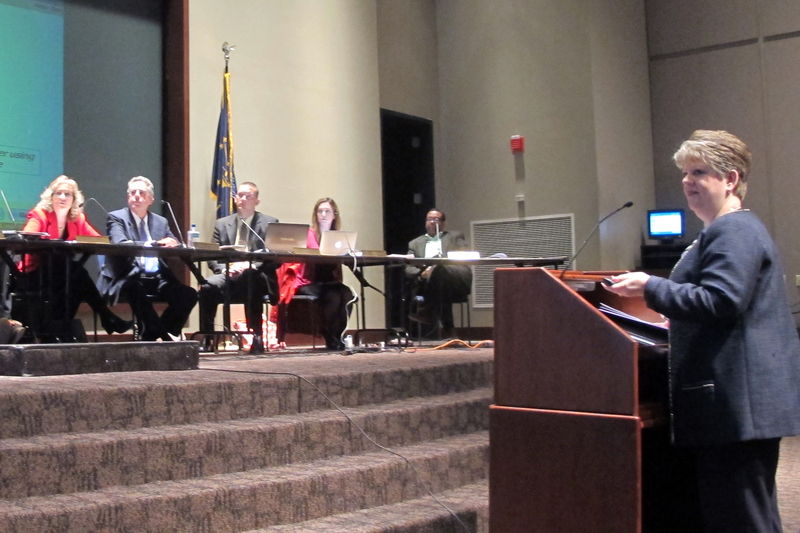 IDOE Director of Assessment Michele Walker, right, explains Indiana's testing timeline to the State Board. 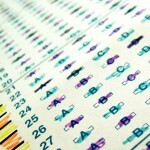 Indiana students will not have to take two rounds of standardized tests this year after all. The State Board of Education agreed Wednesday to drop a plan to administer a second test next month after schools give ISTEP+. The exam draws questions from CoreLink, a bank of technology-enhanced questions likely to appear on new standardized tests next year. It takes about an hour to complete. But the platform required to run CoreLink questions will not run on iPads, which many schools use for online tests. And State Board members questioned the need to administer the test at all, as Indiana is moving away from the nationally-crafted Common Core expectations. “It can’t possibly be based on standards because we haven’t passed them yet,” said State Board member Brad Oliver. The state is in the middle of an exhaustive rewrite of academic standards, and plans to test kids using CoreLink were developed several years ago, before Indiana exited the Common Core. Michele Walker, director of assessment for the Indiana Department of Education, told the board CoreLink questions had been purchased from CTB/McGraw-Hill’s test bank but had been modified to make them Indiana-specific. Walker argued that the state had a “moral imperative” to let students and teachers see the types of questions that will appear on future assessments because teacher salaries and school letter grades will depend on how well students perform on new assessments in 2015-16. She asked the board to move the CoreLink test window to the fall to give schools time to solve technology challenges. But other board members weren’t convinced the test was necessary. “As for the motion, my vote would be to never administer CoreLink,” replied board member Tony Walker, who questioned whether the test could really be relevant to Indiana students if the state leaves Common Core. Board member Cari Whicker, a sixth grade teacher in Huntington, pointed out teachers are already facing two tests in spring 2015, the current ISTEP+ exam and a so-called “transition test,” designed to help Indiana schools make the switch to college- and career-ready assessments. The board voted unanimously to cancel the May 2014 CoreLink administration. It’s possible that the test could still be administered sometime next school year, but no date has been set. The state is still on track to replace the ISTEP+ with a new test in 2016. CLARIFICATION, 12:49 p.m. EST: An earlier version of this story identified CoreLink as a test, not a question bank. The new, technology-enhanced questions would have been given in the weeks after ISTEP+ testing had the State Board not voted to drop the plan.